The Wheel of the Year is both an annual cycle and the journey of a lifetime. Each revolution of the wheel consists of eight spokes, the Sabbats–the two equinoxes and solstices, as well as the cross-quarter days–festivals that pagans celebrate to honor the natural energies and phases of life and death. As we consciously align with nature’s rhythms, we better understand ourselves and our experiences. The wisdom of the yearly seasons is our guide for dealing with the events we go through in the different seasons of our lives. The Wheel of the Year tells the story of the Goddess and the God, the divine feminine and masculine energies that govern everything that exists. We personify the Divine for the sake of our understanding, but the Goddess and God are not beings separate from us. We are made by and of Divine energy, and we participate in it as we live out our lives. This is what we celebrate with the Sabbats. The story of the Goddess and the God is the story of us and our world. The Witches’ New Year begins with the season of darkness. At this time, we acknowledge that new life begins in the darkness of the womb. Before there was light, there was void. Death is necessary for rebirth. This is a season of reflection. We honor the dead, settle our debts, lay to rest the issues that hold us to our old lives. At Samhain, the God and the Goddess are together in the Underworld. As the Crone, the Goddess withdraws her fertility from the land. As the Dark Lord, the God gathers the departed souls. At this point, masculine and feminine coexist in perfect balance, having faced the Other/the unconscious and accepting the wisdom of the darkness. The illusion of separation between matter and spirit, conscious and unconscious, is at its thinnest now. Spirit crosses easily into the physical world. We honor death without fear, knowing that death is not an end but a rite of passage on the wheel that never stops turning. The God prepares to assume another form in the collective unconscious, as well as to be reborn of the Goddess as the Child of Promise at Yule. The winter solstice is a time of very powerful energy. It’s no coincidence that this is the time when we are most focused on family and loved ones or that this is a time marked by an upswing in births, engagements, and passings. Yule is the time of rebirth. Both mythologically and literally, it is the rebirth of the son/sun. Since the summer solstice, the hours of daylight have progressively grown shorter until the night of Yule, the longest night of the year. From this point, the days again begin to grow longer. In Wicca, we celebrate the return of the sun to the earth and commemorate its mythological representation–the Goddess giving birth to the God in the form of the Child of Promise. At the same time, we mourn the Old God, for he may not exist in two forms. The energy of Yule, a combination of grief and joy, reveals to us a great mystery of life and reminds us that every birth and every death, every beginning and every ending, is in truth rebirth. Imbolc takes place at the midpoint between the winter solstice and the spring equinox. Now, we can feel the lengthening of the days and the promise of spring. The Old God releases the Goddess from the underworld, and she returns to the earth, once again the Maiden. In this form, she is responsible to and for herself only. The Child of Promise is now ready to separate from the Mother, and so he begins to explore and learn all that life has to offer. Both Goddess and God are free to enjoy the purity of youth. Now is the perfect time for purification and “spring cleaning.” Physically, emotionally and spiritually, Imbolc invites cleansing, healing and renewing. The Earth is thawing and so too our bodies. The time for freedom of movement and expression of vitality and joy is coming. Life is stirring within. This Sabbat traditionally is associated with the Goddess as Brigid, the Celtic goddess of poetry, healing and smith craft. Her inner fires inspires us to make way for creation to be born through us. Ostara is the pagan name for the spring equinox, when light and darkness are again equally balanced, with dark giving way to light. On the wheel of the year, this is when the young, frisky God joins with the Maiden Goddess and impregnates her. It is significant that this is not when they marry; that comes at a later festival. Now, they join and separate, the God still free to roam and the Goddess still in her Maiden form. The change in the earth’s energy is palpable. We are filled with desire for spring, sunshine, and warmth. We’re ready to play! But before we can, we must plant our seed, as the God does. Whether you are starting your herb garden or an entirely new life for yourself, this is the time to plant, to invest your intentions in the earth, the material realm. We have entered the sign of the Ram, and we can harness its powerful fire energy to instigate the manifestation of our desire. Beltane is a fire festival halfway between the spring equinox and the summer solstice. At this time, the God and Goddess are wed, and it is a popular time for pagan handfastings. The God assumes the responsibility of adulthood, waking from the unconscious state of instinct to the ability to love and care for another person. From his Pan phase, he evolves into a shepherd. Likewise, the Maiden Goddess evolves into the Mother Goddess. She too steps into her responsibility to the life and family she is creating.The energy of this festival is tremendously celebratory! It is the peak of spring! New beginnings find favor now. It is time to revel in the joy of living. The Midsummer celebration centers on the summer solstice, the longest day and shortest night of the year. The pregnant Goddess, both mother and Queen, requires the support of her consort and bestows the role of King upon the God. Now, a change comes over him as he must take responsibility, not just for his wife and their child but for the people and the land, which are aspects of the Goddess whom he married. He takes this position not out of a desire for power, rather from love for the Goddess. Thus he develops his universal compassion and becomes the strength people depend on as the Sun King. As such, he embodies the energy of fire, which is why the bonfire is a typical ritual in Litha celebrations. In mythology, fire represents consciousness, the divine power of awareness. At Midsummer, the Goddess asks the God to forsake the Dionysian aspect of himself, to become conscious and leave the animal world where there is no individuality or separation from Nature. The gaining of consciousness takes him into the realm of judgment and morality, where it is possible to do good and evil. With consciousness comes awareness comes choice. Now the God is called on to administrate, to make decisions involving others, to exercise wisdom and justice. He assumes this kingly role at his peak, the summer solstice, and from this point, his physical power will wane. So within this climax, there is the promise of the returning darkness. 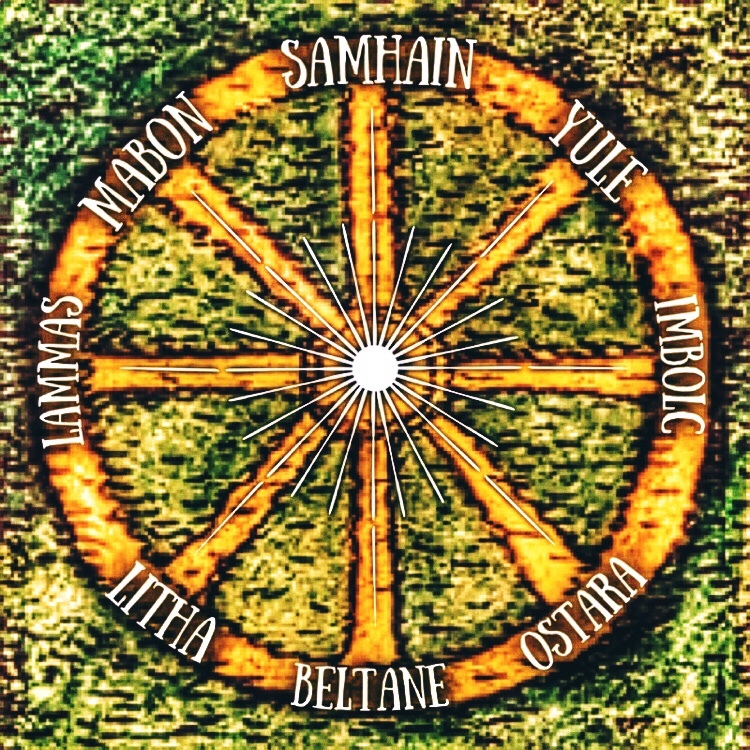 Also known as Lammas, this Sabbat marks the first harvest. The God is in his Corn King form, and at this time he must make the ultimate sacrifice for his people. Like the grain, the God is cut down at the hands of the Goddess. At Midsummer, she gave him the power of king, and now he must give it back to her. Thus he ensures the survival of his people and moves on to his next form. This ritual symbolizes the process of killing the ego, which is necessary if we are to recognize the Divine nature within ourselves and everyone. At this time, there is a choice between the I and the We. If the God were to refuse to make his sacrifice, if he were to succumb to the fear of death rather than learning the lesson of death, he would become a tyrant instead of the people’s leader. When he accepted kingship from the Goddess, he was set apart; now he must choose whether to remain separated or to be united with his people and with all of nature. For us as humans, the price of consciousness is the knowledge of our own mortality. If we try to avoid it, we isolate ourselves and make ourselves unwell by living contrary to our true nature. However, if we accept the lesson of death, we discover life. If we transcend our separateness, we see that we are not alone, that we are connected to one another and to the Universe itself. For after the God is sacrificed, he is not gone. He assumes his new role as the Lord of the Underworld, crossing over from the conscious world to the realm of the unconscious and the Mysteries. Magical workings at this time may include baking a loaf of bread, possibly in the shape of the God, and making a corn dolly, meditating on and giving thanks for what you are harvesting this year.